Has a flammable range at 101.3 kPa (14.7 psi) with air of at least 12 percent regardless of the lower limit. Except for aerosols, the limits specified in paragraphs (a)(1) and (a)(2) of this section shall be determined at 101.3 kPa (14.7 psi) of pressure and a temperature of 20 oC (68 oF) in accordance with ASTM E681-09, Standard Test Method for Concentration Limits of Flammability of Chemicals or other equivalent method approved by the Associate Administrator for Hazardous Materials Safety. Note: 101.3 kPa (14.7 psi) = normal atmospheric pressure, also denoted 1 atm. 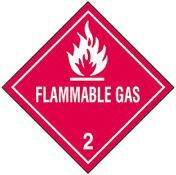 Always know the explosive/flammable limits for any flammable gas. For those who routinely work around flammable materials, special detectors are available that can indicate when conditions are within the flammable limits. You must be properly trained in working with any kind of gas as these can present not only fire, poison, or explosion hazards, but the risk of asphyxiation. OSHA has special standards that apply to propane-powered lifts and forklifts as well. OSHA has a terrific resource page Safety and Health Topics: Welding, Cutting, and Brazing that covers all aspects of those topics, including references to the applicable OSHA standards. Oxyacetylene Welding Safety at the National Ag Safety Database courtesy of Kansas State University. 29 CFR 1910.178, the OSHA Powered Industrial Trucks Standard. UCLA has an excellent multi-page handout Compressed Gas Cylinder Storage and Handling. See also: combustible, flammable aerosol, flammable, flash point.